I'm Stacey from Pretty Books and I'm very happy to showcase my bookshelves at The Overflowing Library today. I currently have two sets of bookshelves and I have to make the best of the space. I hope to have a personal library one day (who needs a guest room?!) with different sections for children's fiction, young adult fiction, adult fiction and non-fiction but for now I'm extremely happy with what I've got. 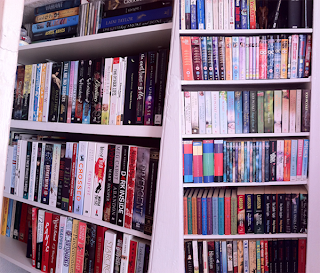 The first set of bookshelves are to the right of my room and they are doubled stacked. I think we built them last summer. The first two shelves mostly contain all my DVDs and DVD boxed sets, with a few odd books. I love teenage dramas! 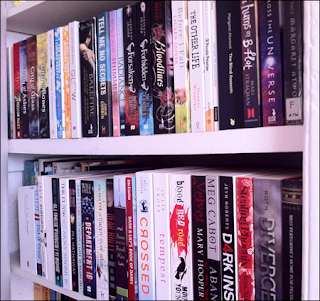 The third shelf is home to (nearly) all of my Jodi Picoult books, arranged by spine colour because, well, why not? I'm very happy that I've recently completed my collection and now own all 18 of her books. Behind the Jodi Picoult books are more books, mostly ones that I read as a child. These shelves are generally arranged by size and series, since I love the way it looks. I should probably aim to put more series sets on my bottom shelf! Although I'm probably too old for the A Series of Unfortunate Events series, I cannot bear to hide such beautiful books away. 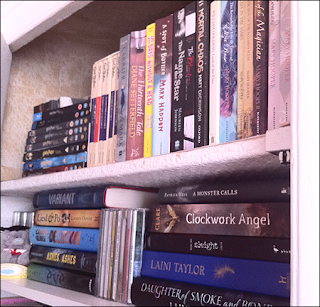 Again, behind these books are ones I read as a child/young teenager (e.g. Jacqueline Wilson, The Sleepover Club and The Princess Diaries). These bookshelves are to the left of my room, which we built shortly after I filled up the other ones. It used to be a built-in cupboard which is why I had to take the photo at an angle. There's a door attached and my bed's in the way. These shelves are triple stacked, mostly with videos and CDs at the back. As you can probably tell, there's no real order to the way I organise my books although I generally know where everything is. 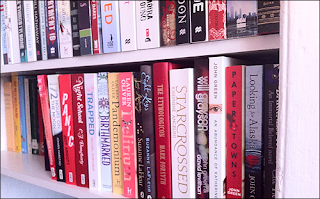 I tend to put my review copies on these shelves but it really is a mixture of everything. 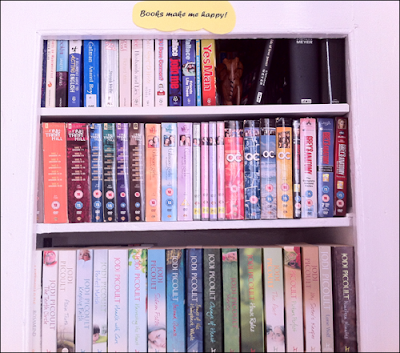 Behind these books are some hardbacks, my non-fiction shelf, and more videos. 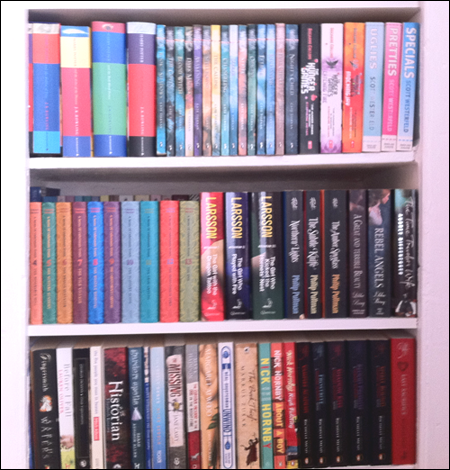 The last shelf again contains two rows of review copies and other books I have purchased as well as more videos. This is what's left of the space I have on my bookshelves, so who knows what I'm going to do in 2012! 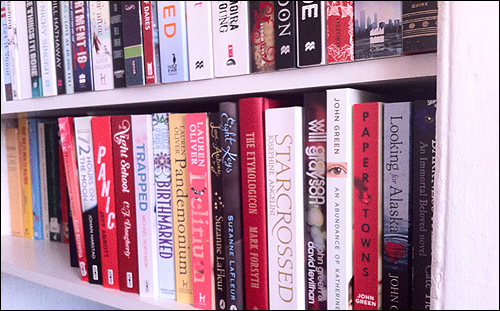 What lovely, tidy shelves you have!